In 1829 a young schoolteacher heard the call of God to preach the Gospel and in April of that year was licensed. On June the first of 1830, he was united in marriage to another schoolteacher—Eliza Wilcox. Moses was born in the Baptist parsonage at Sedgwick, Maine, December 15, 1803. These young people came from fighting stock. His father, Daniel Merrill, was a Baptist minister who served three years in the Revolutionary War. Mrs. Merrill’s father was Brigadier General Wilcox, a famous Revolutionary War soldier. They taught school for one year at Ann Arbor, Michigan, when they answered the call to become missionaries and received their commission from the Baptist Board of Foreign Missions of Boston in 1832 and headed for the far-west, to the foreign mission field of the Nebraska Territory. 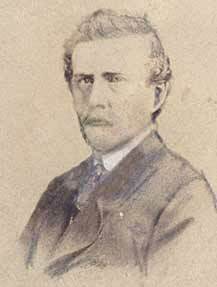 Moses Merrill became the very first Protestant minister to cross the Missouri river into the great plains country. The next day he preached a sermon, the first sermon preached by a Protestant preacher west of the Missouri. At this first religious service there were two Americans, several French trappers, and a number of natives of the Otoe, Pawnee and Omaha tribes. Several songs were sung by the preacher, a short sermon delivered and a prayer offered. Their next move was to organize a public school. The work progressed so rapidly that in 1834 they produced in the native language a Spelling Book, a Reading Book and a Hymn Book and before he died had prepared a manuscript for a second reading book. He also began a translation of the Scriptures into both the Otoe and Pawnee. He never completed this work, but his partial translation of the Bible into these two languages is still in existence. These are among many of the things Moses and Eliza Merrill were able to do in the new territory of Nebraska and it is because of their faithful service that their names grace our ministry. 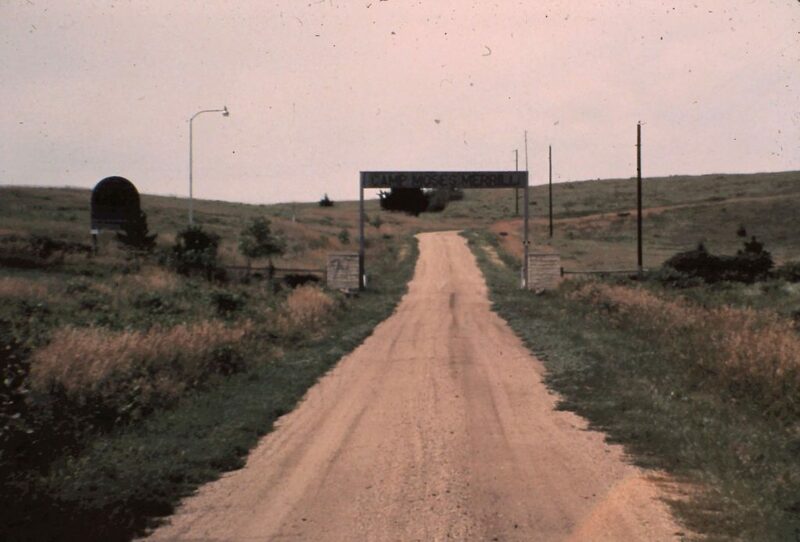 1943 will long be looked upon by Nebraska Baptists as an outstanding year in our history because it was a time when we purchased the Chautauqua Park at Fullerton and held our first camps, assembly and conferences on our own property. 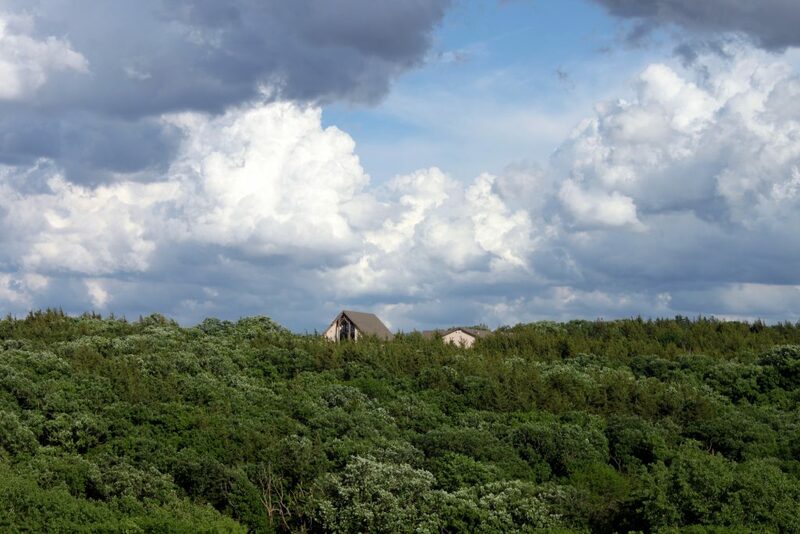 The name was changed to Moses Merrill Baptist Camp and a program of development was begun on these 92 acres of beautiful oak trees, hills, bluffs and farming land. 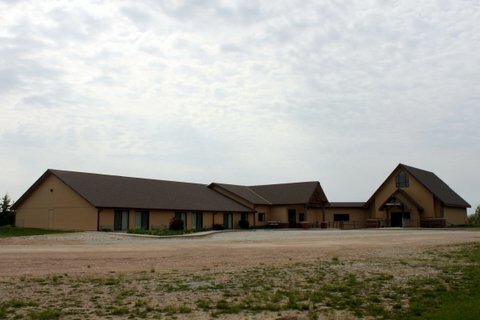 The property is owned by the Nebraska Baptist State Convention and the development and activities are under the direction of the Board of Administration of Camps and Assemblies, subject to the Board of Managers of the Convention. It was the desire of all that a name be found which would have a real significance for Nebraska Baptist, memorializing one who had made a worthwhile contribution to the work in this state. 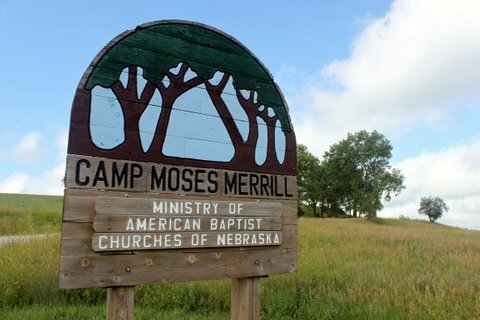 That is why we chose the name of Moses Merrill, who came to Nebraska Territory as a missionary in 1833. As the camp grew it was apparent that a new campground would be needed. A search was started and soon a plot of land located in the hills south of the Platte valley was found. It was a beautiful place with rolling hills and wooded valleys. Described as one of the only spots between Fullerton and Omaha with such nature beauty still available at the time. 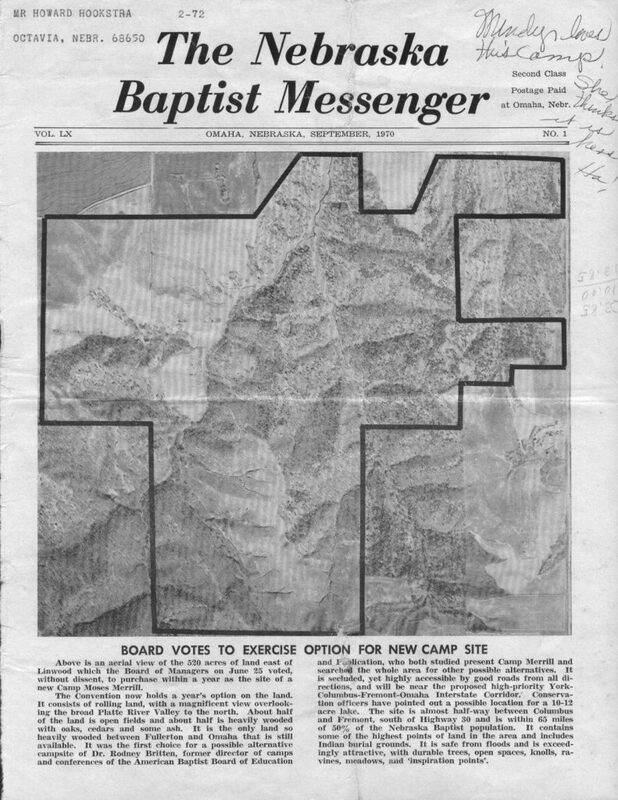 The Baptist leadership moved to obtain the land and began making plans for what the new site would be. Development soon began and a new chapter of Camp Moses Merrill was started. As development began volunteers pledged time and resources to create the new camp. 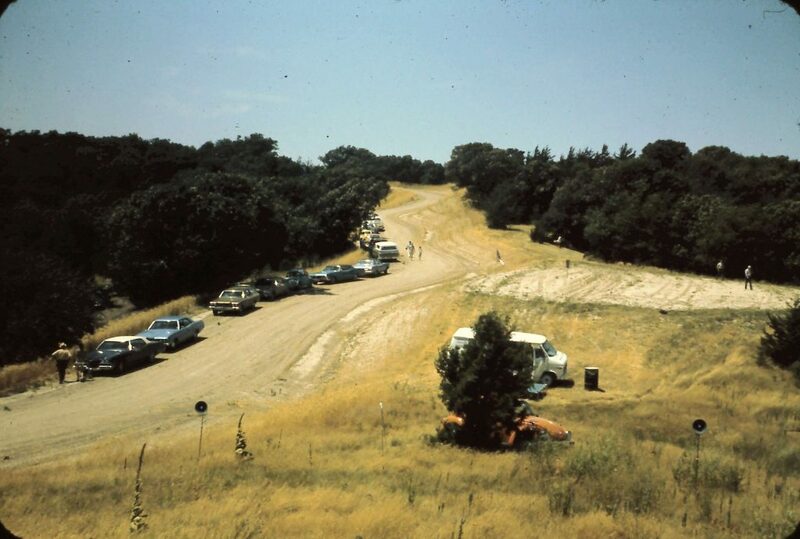 Volunteers working on the camp lived in RVs and built the main camp road. Weaver Hall – Formerly the Faidley building in a Grand Island Park. Lloyd A. Faidley, was a Grand Island Business Man who had a great love for children. The building was originally erected in a Grand Island Park by Ernest W. Augstine, James S. Chubb and Donald H. Weaver, trustees of the Faidley Estate. In 1977 when the Grand Island Park was used for another purpose the trustees authorized the building and remaining Faidley Funds to be moved to Camp Moses Merrill. Judge Weaver from Grand Island made it possible for the building to be moved to the Linwood site. The structure was dismantled, moved and enlarged by men of the First Baptist Church, Grand Island, Nebraska, under the supervision of O. D. Gilpin of Grand Island and Clinton Nash and Keith Nash of Camp Moses Merrill. 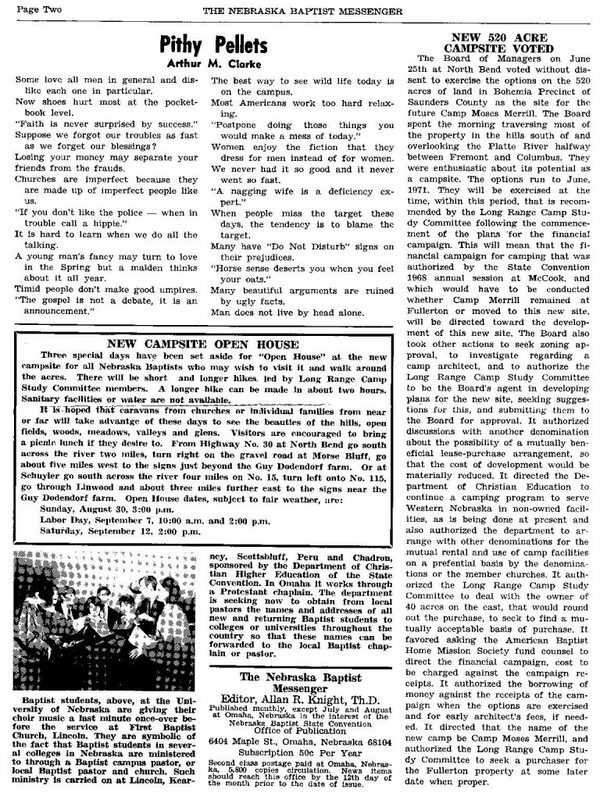 Program Building – Oct. 20, 1979 – First Baptist Church, Palmyra was sold, proceeds were used to build the Palmyra Program Building. Items from the church were also used at the camp. Cabins – Sponsored by churches, many are still sponsored by the church that built them. The churches furnished $5000 and labor to build the cabins. 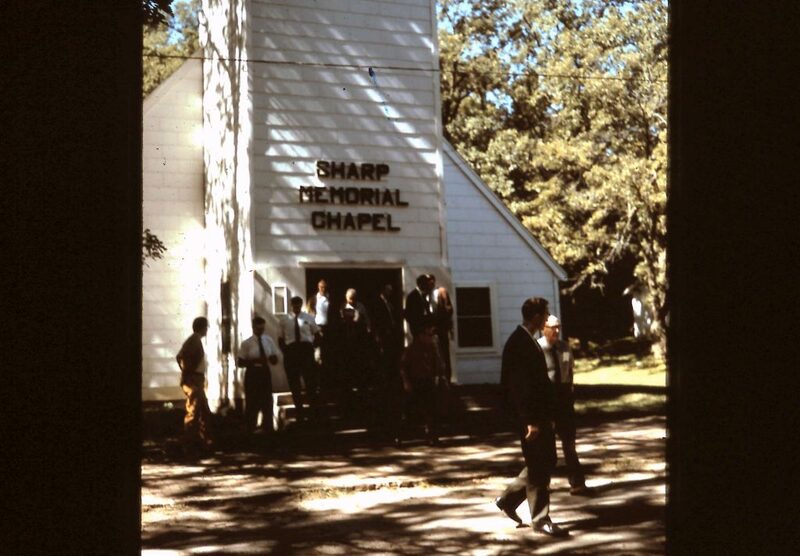 December, 1976 – Four churches have already committed themselves to provide a cabin for the new Camp Moses Merrill at Linwood. In addition three or four other churches are seriously considering the same. The First Baptist Church of Grand Island has pledged the money for the material and the voluntary labor to build a cabin. The Benson Baptist Church of Omaha and the Gibbon Baptist Church of Gibbon have done likewise. The Herman Baptist Church of Herman has voted to provide the money for the materials. The men of the Herman Church and of other churches in the area will provide the labor to build it. 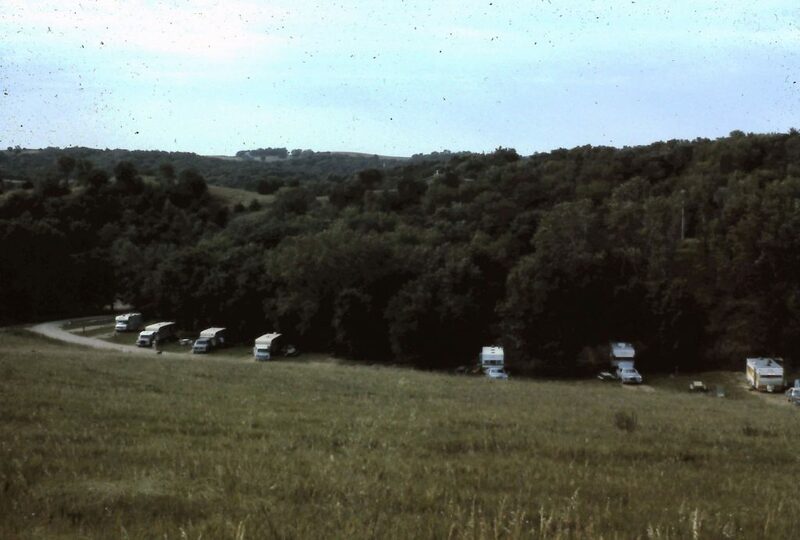 The first camps were held on the new site in 1974. It was a rustic experience in the wilderness but it marked the day many had dreamed of. 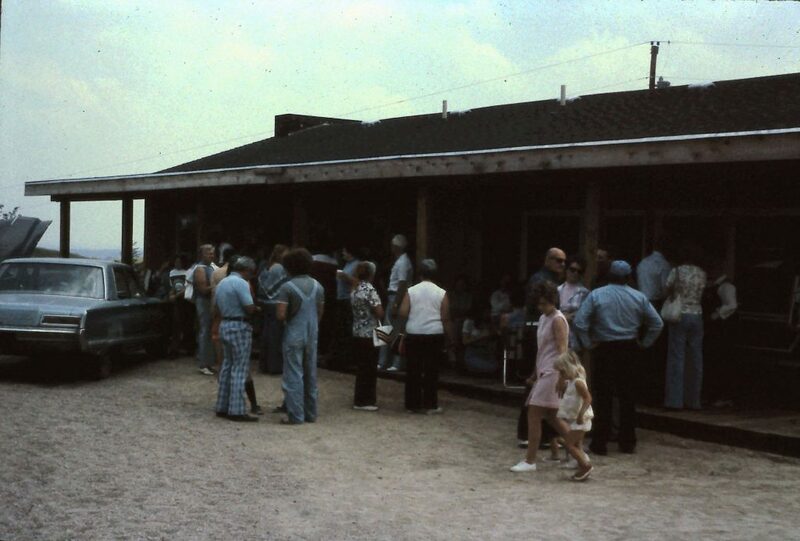 Campers came every summer and in 1976 a grand opening was held. 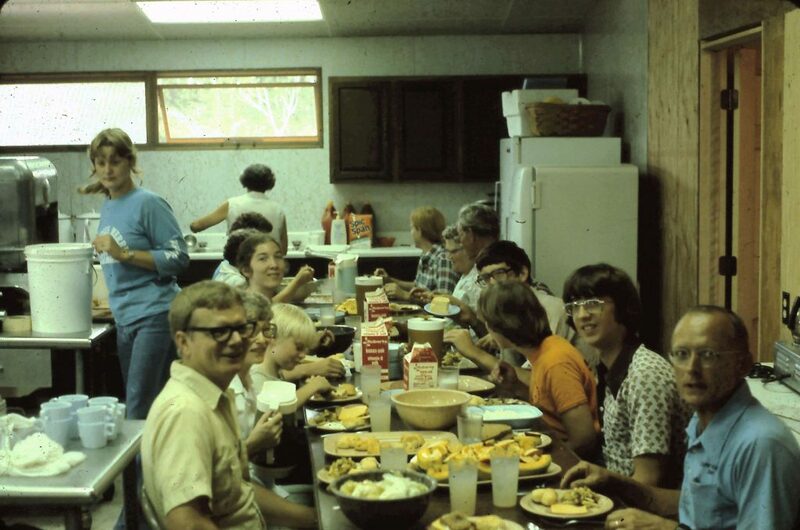 Camp was not so different back then as you might imagine. 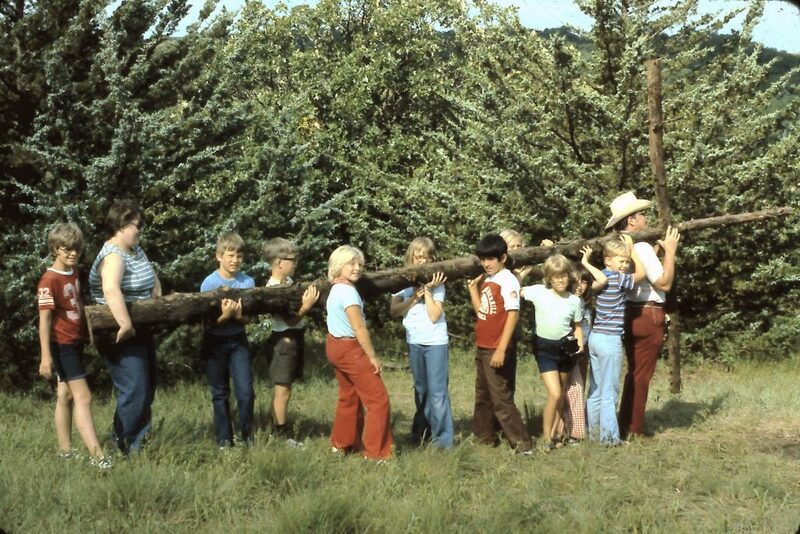 Campers swam, hiked, and enjoyed many of the same traditions that still happen today. Camp was and is still loved because it provides a timeless opportunity to get away and enjoy God and His creation. Today Moses Merrill still forwards the Kingdom by providing a Christ centered place for discovery, growth, and renewal. 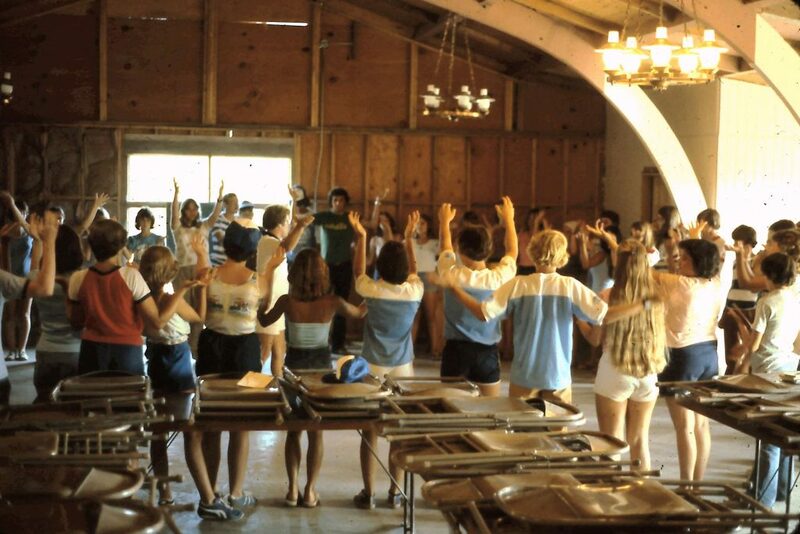 We are blessed by many who gave their time and resources to create the camp we know and love. We are blessed with a rich past that shows God’s provision.